As you prepare to remodel your kitchen or bathroom, you’ll be making a lot of decisions on the finer points of your design. Throughout the process, you may discover that you had far more choices than you ever imagined. One of those areas is cabinet finishes. There’s a lot of different options you can choose from when it comes to cabinet finishes and they aren’t always clear cut, so here are some details about each type of finish to help you understand the differences and decide which one is best for your design. If you’re going for a wood look in your kitchen or bathroom, a stain cabinet finish may be your best option. You’re probably already familiar with stain and the fact that it lets the wood grain show through, giving you a slightly more natural feel than a painted surface. Stains often enhance the natural character of the wood grain and comes in a wide variety of tones. A painted cabinet surface gives a more uniformed appearance and is typically applied over wood with a more uniform surface, free of knots and heavy grain patterns. 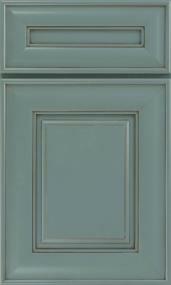 You won’t see the wood grain and typically, the sky's the limit on painted cabinet color choices. Glazed cabinets are created when a transparent glaze is applied over the finished surface to create added depth and dimension in the subtle detailing of the cabinet. Both stained finishes and painted cabinets can be glazed to create a slightly different look. There are different types of glazing processes that you should be aware of, as they will produce very different effects. 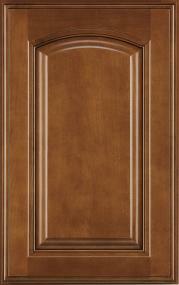 If you prefer a lot of variation from cabinet to cabinet, an allover hand-rubbed glaze is a great choice. In this process, the glaze is applied to the entire cabinet surface and will show variation in the base color. If you would prefer a more uniformed glaze look, you’ll want to go with a pen glaze, where the glaze is only applied to the cabinet detailing and the painted or stained base surface remains even. Opaque cabinet finishes are designed to give you the color choices of a painted cabinet but with the natural wood character of a stained cabinet. The opaque finishing process is used on high-end cabinets and can allow a more natural wood-look, showing more of the wood grain through the painted finish. Laminate cabinet finishes have a thin layer of laminate applied to the external surface as opposed to doing any sort of finishing treatment to the wood itself. The advantage that these types of cabinets have over other finished woods is that they are resistant to harsh cleaning chemicals and more durable. You wouldn’t have to worry much about scratching or denting a laminate cabinet. These cabinets are available in both gloss and textured finishes. Thermofoil is a plastic material which is thermoformed to the profile of an underlying engineered wood core, similar to the laminate cabinets mentioned above. Thermofoil cabinets are especially great if you will have high humidity, such as in a small bathroom. Thermofoil cabinets are available in several traditional looks as well as more contemporary styles, both in wood grain or solid color styles. 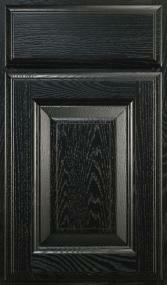 Each cabinet line available through ProSource Wholesale® comes in a variety of door styles and finishes. Take a look at the online product catalog and add those you like to your myProSource project center. No matter your personal style, you’ll find an excellent selection of quality cabinets sure to meet your design specifications.